Journalism is about the acquisition of knowledge. To be effective, journalists must learn how to gather information about all the subjects they cover in the everyday practice of their profession. Journalism also is about the sharing of knowledge. To be of value, journalists must learn how to tap the expertise of professionals and disseminate information to readers and viewers in accessible ways. Since it began, the JMSC has worked across disciplines with many experts and faculties at HKU and other universities to train journalists how to acquire and share knowledge. Its faculty members and students have worked with experts at HKU and elsewhere in business, law, health, computing, science, medicine, politics and public administration, and the arts. They have built partnerships, conducted joint research, and co-sponsored conferences that examine the intersections of journalism and other fields. The JMSC also has taken advantage of experiential learning opportunities that arise in a world crossroads such as Hong Kong. It has also incubated scholarship programs that enable its students to study journalism and other disciplines in other parts of the globe. One of the JMSC’s most important partnerships is with the Faculty of Law, which in 2007 collaborated with the JMSC on a groundbreaking event, the ‘South East Asia Media Defence Litigation Conference’. The conference resulted in the formation of the ‘South East Asia Media Legal Defense Network’, a group of lawyers committing to defending press freedom in the region. The JMSC and Faculty of Law collaborated in again in 2013, with the groundbreaking Media Law & Policy in the Internet Age conference, where 70 experts from 15 jurisdictions examined issues spawned by the digital age. The conference led to a book that includes chapters by lawyers and academics at the forefront of the debate over the issues spawned by the internet—reform of media law, defamation, privacy, free speech and national security. The partnership was active again in 2016. Associate Professor Doreen Weisenhaus, Director of the JMSC’s Media Law Project, co-moderated a seminar, ‘Who’s Got Your Back? Securing Trust and Agency in a World of Backdoors & Gatekeepers’. It was the first event organised by the Digital Asia Hub—an independent, non-profit internet and society think tank based at the JMSC—and co-hosted by the JMSC and the Law and Technology Centre at the Faculty of Law. In 2005, Jim Laurie became Director of Broadcasting and with Rob McBride co-produced ‘Focus Asia Business Leaders’ with the Asian Case Research Centre affiliated with the Faculty of Business and Economics. 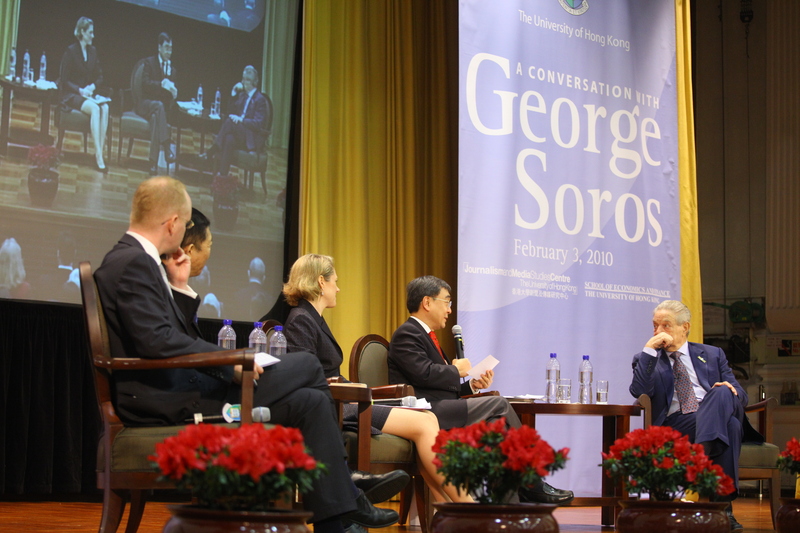 In 2010, the JMSC and the faculty also organised a lecture by billionaire philanthropist George Soros. In 2009, the JMSC published ‘Portrayals of the Family in the Hong Kong Media’ as part of a project by HKU’s School of Public Health to promote societal harmony. It also developed HKU’s first massive open online course (MOOC) with the SPU in 2014. In 2010, Associate Professor of Practice Thomas Abraham worked alongside the Faculty of Science on a new core curriculum course called ‘How the Mass Media Depicts Science, Technology and the Natural World’. 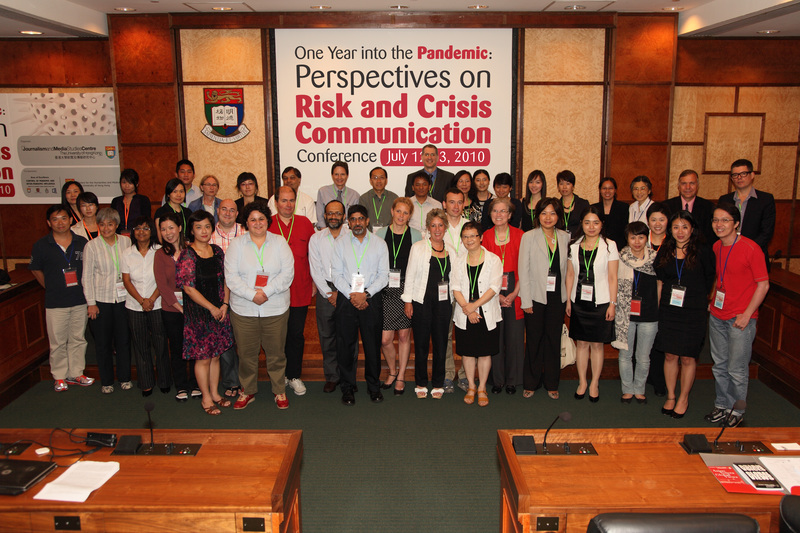 In 2010, a JMSC conference, ‘One Year into the Pandemic: Perspectives on Risk and Crisis Communication’, was co-sponsored by the University Grants Commission and the Centre for the Humanities and Medicine at HKU. In 2011, in cooperation with the Department of Computer Science, the JMSC hosted a research seminar on computational journalism in which a panel of journalists and computer experts shared their research on the subject. In addition to such events, the JMSC has worked with many faculties and departments in the production of promotional and training videos and in the development of websites and online communication skills. The JMSC began in 1999 as a two-year, part-time Master of Journalism programme with 26 students. It now offers Bachelor of Journalism (BJ), Master of Philosophy (MPhil) and Doctor of Philosophy in Journalism (PhD) degrees. Together, 130 undergraduates and almost 100 postgraduates (including three PhD students) are enrolled in JMSC programmes today. Since 2001, when the first MJ class graduated, the JMSC has conferred 955 degrees in its four programmes through HKU’s Faculty of Social Sciences. The full-time MJ programme was launched in 2000. The first undergraduate courses began a year later and the BJ programme was launched in 2004. The first PhD candidate was admitted to the Centre in 2002, and the first MPhil candidate in 2003. The addition of three new degree programmes since it began, in addition to steadily increasing enrollment, has required the JMSC to continually develop a range of new classes while regularly increasing the capacity of others. From the outset, the JMSC emphasised convergent media, teaching students how to tell stories in print, audio, video and online. Its location in Hong Kong and its access to mainland China and Asia provided ample opportunities to use real-world news events as the basis of classroom assignments and exercises. Differences in the region’s political systems and laws and in ethics and levels of censorship also provided material for classes in media law and related topics. To meet today’s curriculum needs, the JMSC also offers courses in news reporting and writing for all forms of traditional newspaper, radio, television journalism as well as in new media, media law and ethics, and journalism history and traditions from regional and global perspectives. Today, the JMSC also offers specialisations in photojournalism and documentary production. In addition to its core courses, the JMSC offers short professional courses to local and regional groups and massive open online courses (MOOCs) to international audiences. Public courses have covered such topics as online media skills, video production and photography, while MOOCs have been offered on such topics as data journalism and news literacy. In the fall of 1999, with its first classes, the JMSC began implementing its ongoing strategy for training journalists—solid skill development across platforms. Dan Gillmor and Andrew Lih, experts on technology and the internet, came from the US to co-teach new media. Peter Eng and Phyllis Fang Savage, two Hong Kong-based experts, co- taught Reporting and Writing. In the JMSC’s second semester of operation, Doreen Weisenhaus became the first full-time faculty member, teaching media law and 'Critical Issues in Journalism and Global Communication'. Later in 2000, Gene Mustain became the second faculty member, teaching reporting and writing and introducing, a year later, a class on long-form, narrative non-fiction called ‘Literary Journalism’. In the fall of 2000, the JMSC also launched a course in business and financial journalism, which became a cornerstone of the curriculum, a natural area of emphasis given Hong Kong’s global commercial importance. The course and related ones that emerged over the years were taught by experts from major publications, some of whom became faculty members, such as Nailene Chou Wiest, David Plott and Jeffrey Timmermans. In 2003, the JMSC became one of the first journalism schools in the world to introduce Wikipedia when Andrew Lih joined the faculty full-time. He devised assignments that explored the joy and chaos of collaborative editing in a class called, ‘You've Got Mail: Interactive Media, News and Communication’. In 2003 and over the next several years, after Thomas Abraham and Masato Kajimoto joined the faculty, the JMSC began offering courses in international reporting, health reporting, news literacy and multimedia reporting. It also began offering courses in photojournalism and, after Jim Laurie joined the faculty, television production and documentary making. In 2010, the JMSC began offering three special subject areas for MJ students: Science, Health, and Environment Reporting courses, Business and Financial Journalism and China Studies, became the three specialist subject areas in the MJ programme. In 2012, Documentary Studies was added to the MJ specialist subject areas. Documentary filmmaker Nancy Tong, who joined the JMSC in 2008 as a Visiting Associate Professor, and a JMSC Honorary Professor and Oscar-winning director Ruby Yang, have taught documentary video production to students who have gone on to produce award-winning documentaries featured at international film festivals. As the JMSC continues to focus on preparing students for the fast-changing digital age, some of the latest courses to be offered by the Centre include ‘Data journalism’, ‘Digital media entrepreneurship’ and ‘Social media analytics’. In 2011, ‘Data journalism’, with visual and data literacy skills at its heart, was offered for the first time. The course, originally named ‘Computer-assisted reporting’, integrates data collection and analysis, graphic design, and programming to turn online databases into visually compelling stories. In 2015, ‘Digital media entrepreneurship’ was introduced into the curriculum. It guides students through the conception, prototyping and development of a new digital media enterprise, whether through an employer or as a startup. In the spring of 2016, faculty member Dr Fu King-wa launched ‘Social Media Analytics for Journalists’; it examines techniques for acquiring, analysing and visualising social media data, including through programming. In 2016, the JMSC also added its ‘Introduction to Strategic Communications’ at the BJ level, and revamped its core undergraduate reporting and writing curriculum, expanding the introductory course to a full year. Nancy Tong joined the JMSC in 2008 as a Visiting Associate Professor to teach Documentary Studies. 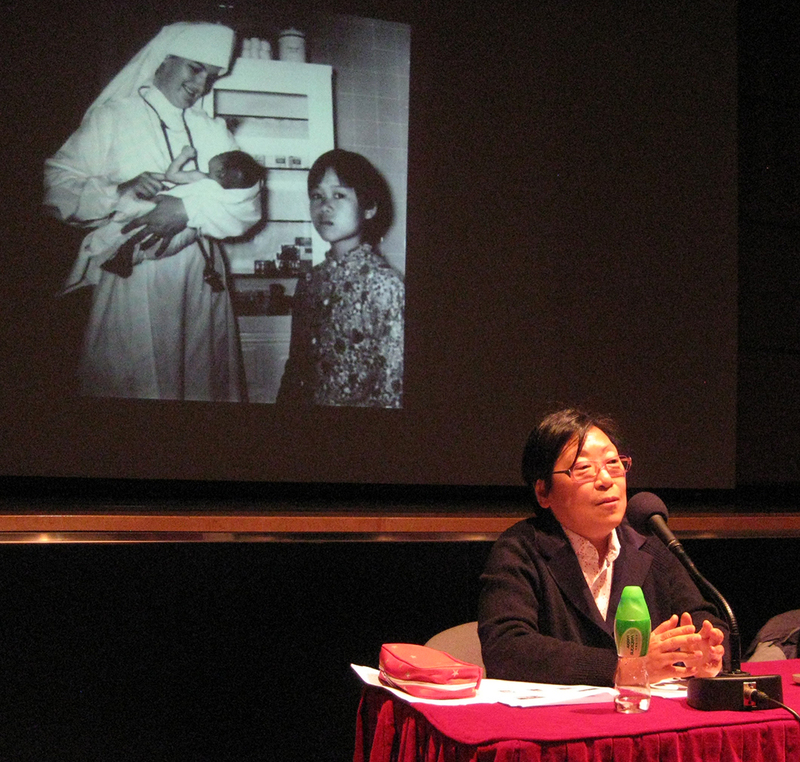 In 2011 she produced documentary Trailblazers in Habits, looking at the history behind, and social impact of, Hong Kong’s social pioneering nuns, the Maryknoll Sisters. 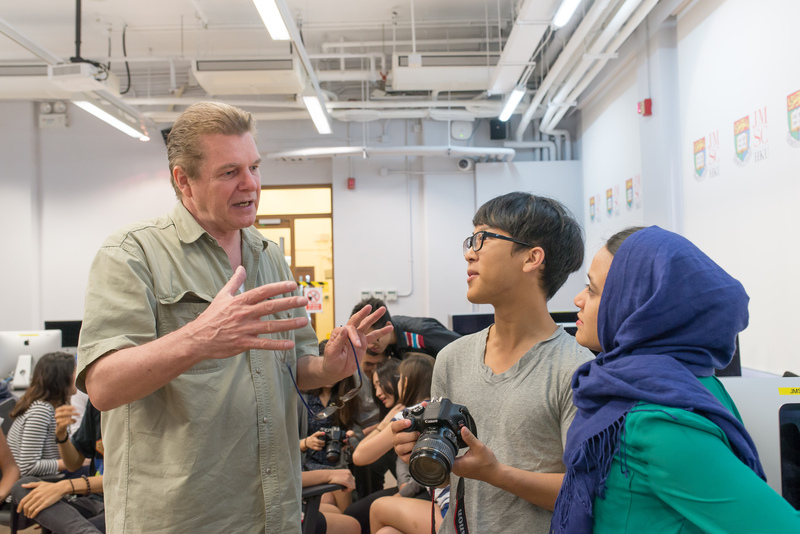 A key tenet of JMSC programmes and courses is experiential learning, whether through hands-on classes or coverage of live events and production of content for professional media. An early example came in the spring of 2000, when JMSC graduate students travelled to Taipei to cover the Republic of China’s election, won by the Democratic Progressive Party, ending more than half a century of Kuomintang rule. In 2004, JMSC graduate students returned to Taipei to cover the national election again. President Chen Shui-bian was shot and wounded the day before the election and JMSC students wrote stories and provided editorial assistance to Hong Kong publications covering the story. In 2006, Director of Broadcasting Jim Laurie, aided by students, produced the first ‘Focus Asia Business Leaders’ series, comprising half-hour episodes showcasing profiles of prominent Asian business leaders. In 2009, a team of JMSC students and alumni produced financial and economic reports for Japan’s national broadcaster, NHK. In 2010, the VoxAsia website, brainchild of JMSC Senior Teaching Consultant Diane Stormont, was maintained by MJ students taking the Advanced Online Journalism class. As a former bureau chief for Reuters in Hong Kong, Stormont wanted to give ‘students a taste of real newsroom experience, particularly the wire service experience in reporting set events’. In 2011, JMSC students covered ‘HKU 100: Overnight at the Science Museum’, followed in February/March 2013 when BJ students covered a ‘Night at the Museum of Art with Andy Warhol’. HKU and the Hong Kong Museum of Art granted exclusive access to the largest collection of Warhol’s art ever to be exhibited in Asia. In 2013, JMSC students interned at TEDxVictoriaHarbour to provide coverage of the annual travel and tourism conference in Hong Kong, and also covered the IB World Student Conference at HKU in real time in August. 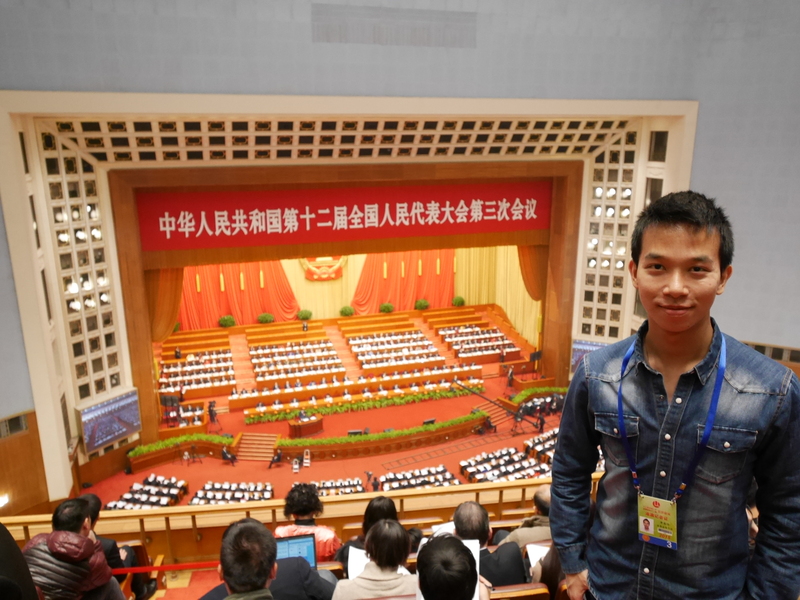 Over the years, JMSC students also have travelled to Beijing to cover China’s National People’s Congress (NPC) and the National Committee of Chinese People’s Political Consultative Conference (CPPCC). In March 2013, BJ students helped cover the leadership changes in Beijing for leading Hong Kong newspapers. Hong Kong itself has also provided ample experiential learning opportunities. In December 2005, JMSC students covered the World Trade Organization conference and protests by South Korean farmers. In 2010, the JMSC produced a geo-web application on the Google Earth platform to present the results of the 2008 Legislative Council Election in Hong Kong and in March 2011, JMSC students covered the announcing of Hong Kong's budget live online. The Occupy Central protests and Umbrella Movement in Hong Kong between September and December 2014 perhaps gave JMSC students their most high-profile opportunity to develop their skills in the reporting of events that attracted global attention. A group of MJ students was commissioned by US television channel MSNBC to produce a feature-length documentary, ‘The Umbrella Movement’, which included commentary by the president of Hong Kong’s Legislative Council Jasper Tsang and student leader Nathan Law. 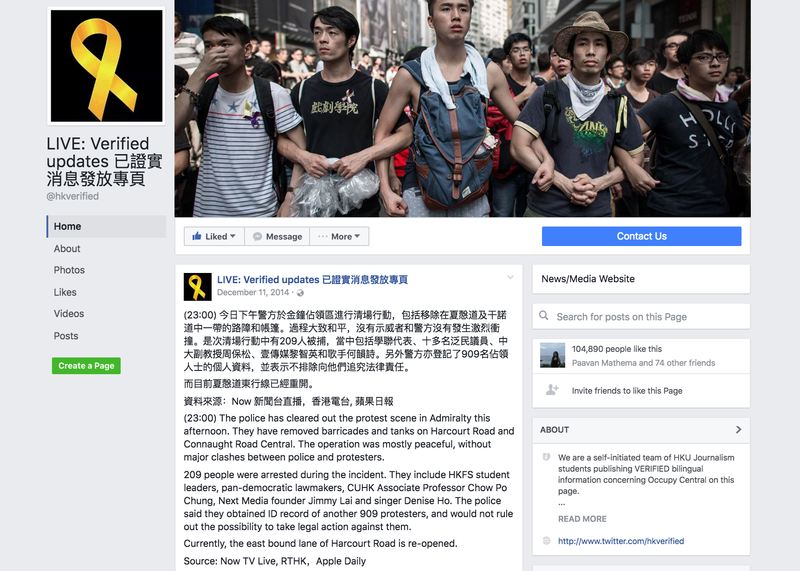 BJ students also created the ‘LIVE Verified HK’ page on Facebook to report in real-time on the protests. The page garnered more than 100,000 ‘Likes’ in its first week, and was also featured in The New York Times and on BBC. The JMSC has also partnered with local media organisations to enable students to gain experience in creating ready-for-broadcast content. In October 2008, four episodes of the 'Focus Asia Business Leaders' series produced by students and faculty were aired on prime time ATV World. From February to April 2012, the JMSC partnered with public broadcaster Radio Television Hong Kong (RTHK) to produce Cantonese news content for RTHK Radio 1’s morning Talkabout show and its evening Phone Openline Openview. In September 2012, Hong Kong Broadband Network (HKBN), one of Hong Kong’s three major cable providers, also ran packages produced by JMSC students. To attract and help top students, the JMSC has developed several scholarship funds awarded on the basis of academic or professional merit and career aspirations. Specifically for MJ applicants, the JMSC Journalist Scholarship has fully or partially supported students from mainland China, with the JMSC Overseas Talent Scholarship supporting students from elsewhere in the world. Similarly, the Hong Kong University Graduates Association Journalism Scholarship has supported MJ students from Hong Kong, mainland China and overseas. It also has provided subsidies to JMSC students selected for unpaid internships and scholarships, and those in overseas training programmes or conferences that encourage a career in journalism. In 2012, Google funded three Data Journalism Scholarships for MJ students who devoted the first semester to core courses in the MJ programme, and then concentrated on special seminars and data journalism courses and advanced computational courses from the Department of Computer Science and the Faculty of Engineering. The Open Society Foundations (OSF) (formerly Open Society Institute) has funded scholarships since 2004 to recognise ‘outstanding individuals with the potential to become leaders in their chosen fields'. The Open Society Foundations South Asia Program Award scholarships funded half of the costs for overseas students’ tuition, airfares and accommodation, with the JMSC providing the balance. The SCMP Wah Kiu Yat Po Journalism Scholarship Fund was used by the JMSC to award cash donations from the Wah Kiu Yat Po Readers’ Loan Fund for Post-Secondary School Students. The fund is operated by the South China Morning Post. In partnership with Asia Pacific Vision, the JMSC in 2015 also established The Mick Deane Scholarship fund for broadcast and video students. The fund is named in honour of the veteran British cameraman who was killed by a sniper’s bullet at the age of 62 while covering protests in Egypt in 2013.  A number of individual private donors have also supported the centre over the years. Mrs Lee Shum Shuk Yuen donated HK $1 million to set up the Lee Kam Woon & Shum Shuk Yuen Education Fund, and the same amount was donated by the descendants of the late Mr Shum Wai Yau to set up the Shum Wai Yau Journalism Education Fund. Vicky Shek Zeitlin Memorial Scholarships have been awarded to students from mainland China or journalists who have contributed to news freedom. Arnold Zeitlin, an early JMSC supporter, donated US$67,500, accompanied by a matching grant of US$62,500 from The Freedom Forum, USA, to the University of Hong Kong Foundation for Educational Development and Research. The William F. Woo Memorial Scholarship—set up by friends of family members in memory of the JMSC visiting professor who also was a journalism professor at Stanford—has benefited mainland Chinese students at HKU and Stanford University. JMSC students have also won scholarships to study at other institutions around the world. In September 2012, BJ student Saga McFarland was selected as one of the first five HKU undergraduates to participate in the Yale Visiting International Students programme. 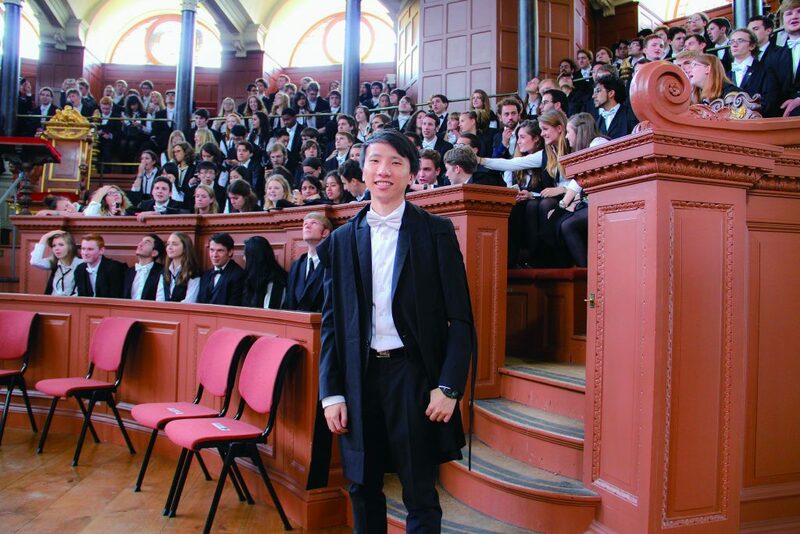 In September 2013, James Chan (BJ, 2013) won a Walter Kwok Scholarship to enroll at Oxford University to study in its Master of Public Policy programme. The scholarship provides all tuition and college fees along with living expenses in England. In 2014, Billy Wong Shing-keung, a second-year Bachelor of Journalism student from Hong Kong, was awarded the Pembroke-King Programme Scholarship at the University of Cambridge, one of four students in the world selected for the summer programme scholarship. In addition to its core programmes, the JMSC has also played a role in educating the public through professional short courses, workshops and online courses. The Media Academy for Pros (MAP) learning programme has run study courses for professionals as well as high school, college and university students wishing to expand their media skills and knowledge. Classes have ranged from practical production-related courses (such as 'Basic Online Media Skills', 'Video Editing on Final Cut Pro', 'Basic and Advanced Photography' and 'Basic Video Shooting') to more academic and theoretical courses (such as 'Internet Strategy for News Organisations', and 'Investigative Journalism in a Global World'). Participants have included staff from media organisations such as the South China Morning Post, Next Magazine, NPR and CNN International, as well as other professionals and students. More general public courses have also been offered on topics ranging from fundamentals such as effective English-language writing to advanced subjects such as data journalism and technical skills, including documentary filmmaking, video shooting and editing, photography, and how to build and manage a website. Public courses and lectures also have been provided outside of Hong Kong. Between 2011 and 2013, the JMSC operated out of HKU’s Shanghai Study Centre, which also housed students of Architecture, Business & Economics from HKU. Various public classes and lectures were given by JMSC staff and local media professionals on topics such as media training basics, writing and reporting, social media and financial journalism. 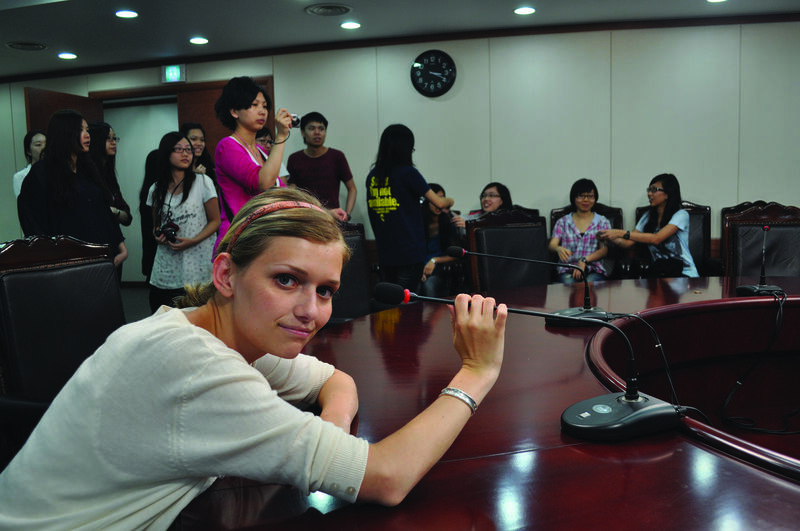 In 2011, the JMSC offered a three-week summer programme in Shanghai called ‘Career Discovery in Communications’. The course aimed to enhance the creativity and communication skills of young people by introducing them to the world of information technology. It was open to senior high school and undergraduate university students from anywhere in the world.